COMPATIBLE WITH IPHONE 7 PLUS, 6S PLUS, IPHONE 6 PLUS, GALAXY NOTE 7, 5, 4, S7 EDGE, S6 EDGE PLUS, NEXUS 6P and OTHER DEVICES. The Gear Beast Smartphone Hand Strap is designed for every athlete or beginner who is seeking a safe, convenient way to hold their phone while running, walking or hiking. Constructed of soft, sweat resistant neoprene, this hand strap is both comfortable and durable. Supports phones measuring 6.25 X 3.30 inches or less. Constructed of SOFT, SWEAT RESISTANT NEOPRENE, this hand strap is both comfortable and durable. KEEP YOUR PHONE and VALUABLES SAFE. 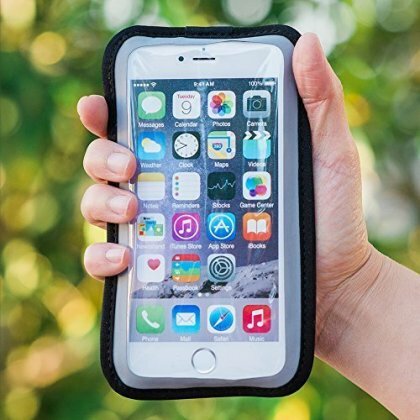 Improved velcro closure ensures that your phone stays secure in the hand strap while running. A specially designed VALUABLES POCKET allows you to safely carry your ID, key, money or credit card. ENHANCED TOUCHSCREEN SENSITIVITY FOR EASY PHONE OPERATION. The Gear Beast Running Hand Strap is designed for every athlete or beginner who is seeking a higher performance running accessory for their smartphone or iPod MP3 player. The ultra-thin, but tough, 0.3 mm screen protector allows you to easily access your music and apps. REFLECTIVE SAFETY BAND ensures that you are seen while running at night.